France and Germany have signed a Treaty of Cooperation and Integration, which, according to Romania, reflects the commitment of the two states to consolidating the European project. 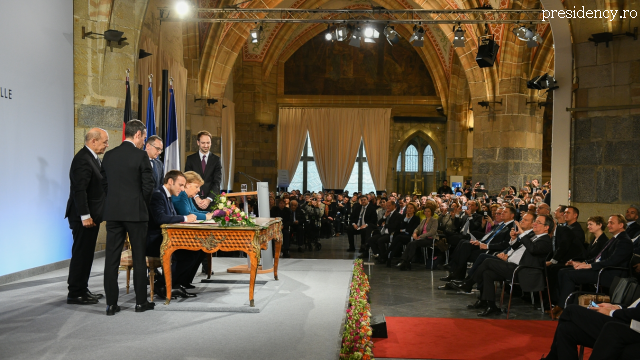 The Treaty of Franco-German Cooperation and Integration was signed by the French President Emmanuel Macron and the German Chancellor Angela Merkel in Aachen. The choice of location was not random, as the city in western Germany is the place where Charles the Great (Charlemagne) established his court, on the border of two of the EU’s founding members, Belgium and the Netherlands. The new treaty is legally and politically grounded in the Elysee Treaty of 1963, signed by Charles de Gaulle and Konrad Adenauer, which set the foundation for the historic reconciliation between France and Germany. The new treaty is aimed at adapting the relations between the two countries to the challenges of the 21st century, with focus on strengthening cohesion at European level. The treaty provides for a convergence of the two countries’ economic, foreign and defense policies, cross-border cooperation and a joint parliamentary assembly, made up of 100 French and German MPs. According to analysts, the treaty, which is intended to reassert the centrality of the Franco-German partnership, which has been the driving engine of the EU, was signed at a time of existential crisis with regard to European integration, triggered by an unclear Brexit and the nationalist inflammation of member states from the centre and east of the continent. To Romania, which is currently holding the 6-month Presidency of the Council of the EU, and which was represented by President Klaus Iohannis at the signing ceremony, the event is of utmost importance. In his speech, Romania’s President said that the signing on January 22nd, 1963, of the Elysee Treaty, helped create possibly the most grandiose integrationist political project in history: today’s European Union. The rebirth of the ‘Elysee spirit’ should bring us the energy we need to carry on our predecessors’ vision and efforts to build a strong, united and cohesive Europe, and, as of today, we also have ‘the Aachen spirit’ to guide us through, president Iohannis said. According to him, against the current European background, strengthening the European project is a must, based mainly on the unity and solidarity of its members. This new treaty, the Romanian head of state also said, is not just an expression of Germany’s and France’s will to strengthen their special and historic relation, but it equally reflects the genuine expression of the hope that, despite inherent differences in vision regarding the common European future and the pace and direction of development, cohesion will eventually prove its power. “‘The Aachen spirit’ will accompany us along the way to the Summit of Sibiu, in May 2019, where our common message should sound like this: we need a strong, inclusive and cohesive Europe, ready to face all challenges” President Iohannis also said.